It’s now just 20 days before my new book High School Football in Texas: Amazing Football Stories from the Greatest Players of Texas is released by Sports Publishing out of New York City. It’s currently for pre-order online at Amazon and Barnes and Noble. The process of writing my first book has been a real learning experience for me, but I believe that readers will enjoy untold high school stories from some of the greatest players in the state like Pro Football Hall of Fame members Raymond Berry, Earl Campbell, Eric Dickerson, “Mean Joe” Greene and LaDainian Tomlinson, who I spoke with personally about their high school memories. In all, I interviewed over thirty NFL players past and present, plus Lone Star State legends like Todd Dodge, Ken Dabbs and Ken Hall. Katy’s Andy Dalton, who is currently the quarterback of the Cincinnati Bengals, is on the cover. Part of the publishing process was getting people to read the unedited galley editions of the book for “blurbs”written for the back cover. 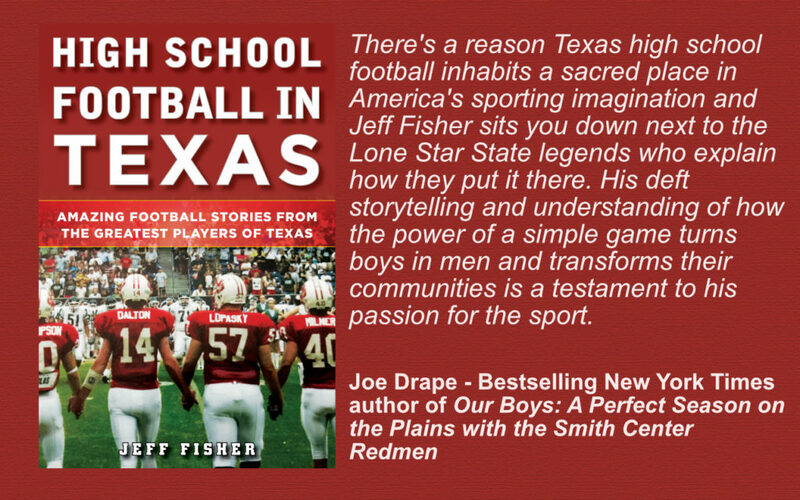 For this task, I turned to several people, including noted authors Joe Drape and Drew Jubera, who have written their own high school football books that I love. I can’t thank them enough for taking time out of their busy schedules to read my book. Their “blurbs” are below. Order Joe’s book by clicking here. Order Drew’s book by clicking here. On Wednesday, I’ll put out two more blurbs from two Texas high school football coaches I truly respect — Mark Ball and Chuck Petersen.